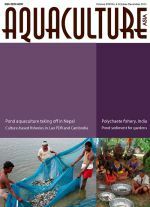 Promising aquaculture practices for sustainable intensification. 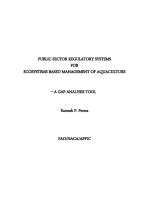 Culture and breeding of Archcentrus spilurum at Tuticorin District of Tamil Nadu, India. Searching for ecological ways to reduce WSSV impact. Fisheries and aquaculture-based livelihoods prospects in East Kalimantan, Indonesia. 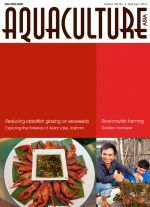 Linking farms and landscapes in the governance of sustainable Vietnamese shrimp aquaculture. 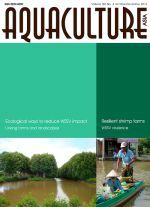 Resilience of shrimp farming based livelihoods in the Mekong Delta, Vietnam. 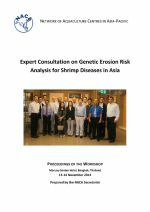 Farming system affects the virulence of white spot syndrome virus (WSSV) in penaeid shrimp. Integrated rice/crayfish farming in Hubei Province, China. 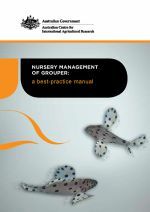 Improvement of seaweed Kappaphycus alvarezii culture production by reducing grazing by rabbit fish (Siganus spp.). Exploring the fisheries of Wular Lake, Kashmir, India. Golden mahseer Tor putitora - a possible candidate species for hill aquaculture. Free primers for specific detection of bacterial isolates that cause acute hepatopancreatic necrosis disease. Special session on regional cooperation for improved biosecurity. AHPND detection discussion group established.